Graphic courtesy of Kaboose, Inc. The winter season is upon us- the weather turns cold and icy and people begin to count the days until they get a little time off from work or school. Why not warm yourself by the kindling Chanukah lights? Local Jewish groups are getting ready to roll out the red carpet for this well-known religious holiday, which will take place this year from sundown Dec. 20 to sundown Dec. 27. 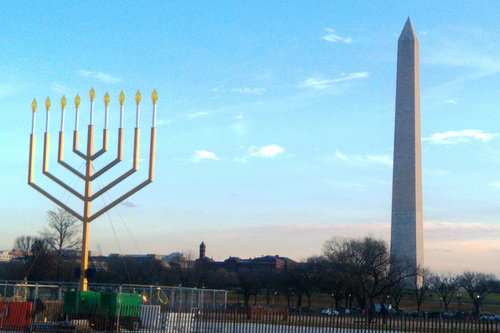 Drop by the DCJCC every night to light the menorah and see what else is in store! Focusing on the Maccabees and their military victory, plus food! Greater Washington Community Kollel features a parenting speech and magic show! Festival of Lights, Latkes and Family Fun! The annual AishDC party includes events catered towards kids and teens. Children’s mitzvah project followed by pizza, latkes and sufganiyot! Who do you know who should be honored as a Jewish communal leader? The Jewish Federations of North America ask this question for a third year with their Jewish Community Heroes project. Individuals were allowed to nominate their mentors until late September. Official public voting wraps up the night of Nov. 10, then a panel of varied judges (including our own Rick Recht!) will choose five finalists from 20 semifinalists in the A small team will choose from 20 semifinalists from professional and volunteers categories. The overall winner will be announced in December. Now’s your chance to stand up for Jewish heroes in the DC area! Close to home, several inspiring leaders have already been recognized for their contributions to the Jewish world. Learn more about them here, and click on their profile pages for more info! Daniel Ratner, Rockville, Md. AishDC board member and Shabbat hoster. Judy Lowitz, Rockville, Md. Pediatric nurse, community/Israel volunteer, kidney donor. Rabbi Reeve Brenner, Rockville, Md. Founder of Inclusionary Sports for kids with special physical needs. Dr. Erica Brown, Silver Spring, Md. Washington-area adult classes teacher on Jewish subjects. A hearty mazel tov to all of these amazing leaders…and it’s just the tip of the iceberg here, folks. Check out the full nominees page for much more! Read years’ past coverage here and here.